Avoid being arrested and handcuffed. Please tip properly. You can tell a lot about people by the way they tip. Are they cheapskates or are they just frugal? Are they generous or are they over-the-top spenders? It all comes down to who follows commonly accepted tipping practices, and who doesn’t. Woe be to those who these days don’t tip at all, even for apparently legitimate reasons. The police may be summoned and arrests made. It’s the American way for the 21st Century, I guess, and I hope it’s not a trend that’s spreading north to Canada. After arguing over the bill, the restaurant called the cops, who arrested and handcuffed the couple. Perhaps you will recall a news report from a while ago about a couple from Bethlehem, Pennsylvania who refused to pay a $16 gratuity on a $73 tab at a local eatery. They claimed the service was appalling and underserving of a tip. Restaurant management, however, disagreed (though they admitted service was slow and a bit sloppy due to a busy evening). After arguing over the bill, the restaurant called the cops, who arrested and handcuffed the couple, placed them in the back of the police car, and charged them with theft. A court date was set, but news media pundits speculated the matter wouldn’t hold up before a judge. Still, to my mind it’s an outrageous turn of events, and it’s troubling in that there are many other stories of this kind floating about. If tips are not gifts, then why bother to call them gratuities in the first place? It prompts the question: Have we reached a point in modern civilization where we must include tipping when creating a monthly budget for ourselves for fear of being labelled criminals? Strictly defined, the word gratuity means a “gift of money, over and above payment due for service.” If tips are not gifts dependent on the free will of tippers, then why bother to call them gratuities in the first place. Surcharges would be the proper description. 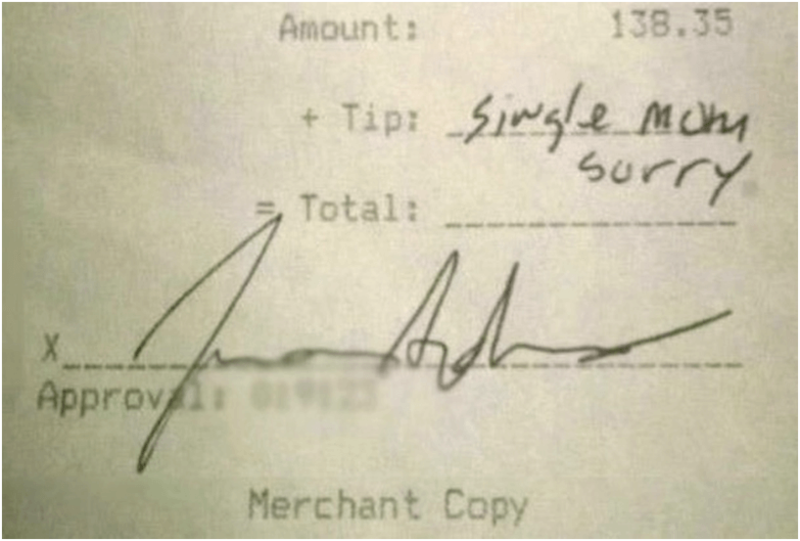 Controversy has followed tipping since the practice began. Michael Lynn, a professor at the Cornell University School of Hotel Administration, notes that tipping probably originated in British taverns during the 1800s. Drinkers slipped a little extra money to waiters “to insure promptitude” (or T.I.P for short). Following the American Civil War, the practice was embraced in North American bars and dining halls. By the late1890s, many believed tipping flew in the face of American populist ideals. By the late1890s, though, a movement against tipping took shape. Many believed the practice flew in the face of American populist ideals of the time since it promoted a “servile class that would be financially dependent on a higher class.” Of course the movement fizzled, and today tipping is a way of life globally, though opinions vary about what constitutes fair tipping practices. A little online research shows general agreement on rules for tipping in Canadian bars and restaurants (and for that matter globally). It is customary to tip 15 per cent on the total bill before tax, and 20 for exceptional service. Ten per cent (for the frugal minded) is borderline acceptable. Tipping anything below that may get you the label of cheapskate. Bottom line on tipping? Best keep it in mind when creating a monthly budget that works for you. Often, restaurants automatically charge a “gratuity” of 15 per cent for larger groups. Since the charge appears in bills, I suppose you had better pay up or perhaps otherwise look forward to being arrested and handcuffed. At the very least, you may come away with a reputation as a cheapie, or face other social consequences as Hollywood actor Jeremy Piven learned recently. You may know Piven as the hot-shot talent agent Ari Gold, from the popular TV series Entourage. But in real life, he’s said to be a cold fish as a tipper, and he recently paid a price for it. Reportedly, he and his real-life “entourage” of 12 achieved the unthinkable when without notice they got a table at one of the world’s most exclusive restaurant franchises, Nobu, in Aspen Colorado (normally Nobu globally declines service to anyone of any status without a reservation). After racking up a huge bill for food and wine, Piven decided that just a signed DVD from his show Entourage would be enough of a tip. The establishment’s management was not happy. Piven was banned forever from all Nobu restaurants around the world. Bottom line on tipping? Best keep it in mind when sorting out entertainment expenditures in your monthly budgeting. Or talk to a lawyer.